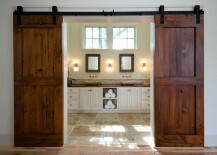 When was the last time you took a really close look at the doors in your house? 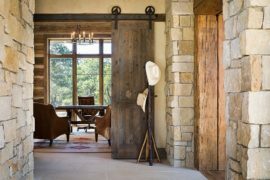 Most of us tend to think only about the functionality of doors, and while it does take precedence, there is also an aesthetic aspect that is often overlooked. 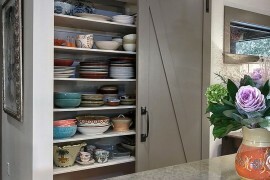 From colorful front doors to lovely French doors that create dreamy dining spaces and lead into stunning backyards, the last few years have seen doors making plenty of noise in the decorating world. 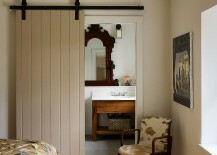 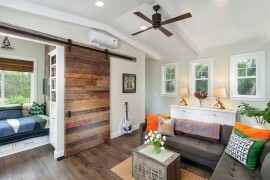 Today we take a look at the latest entrant in this lineup – the sliding barn door. 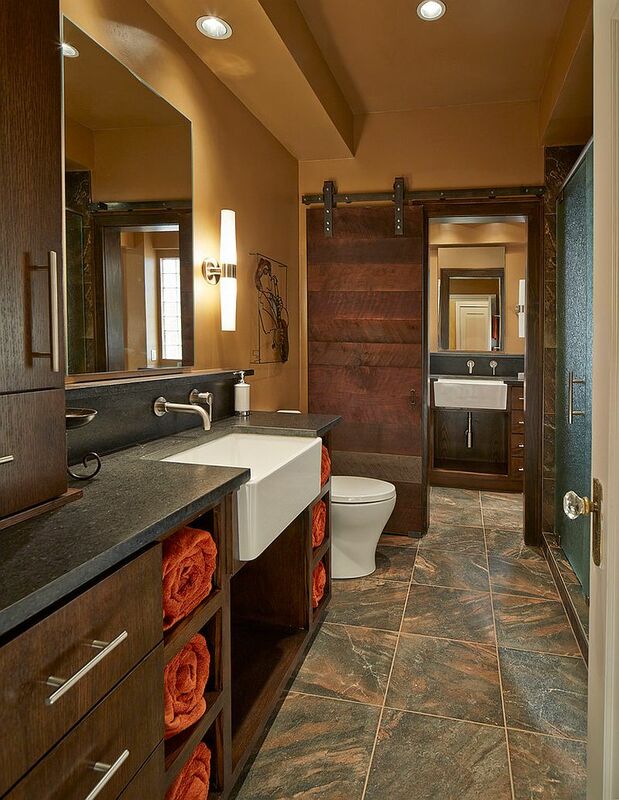 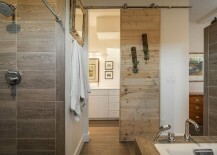 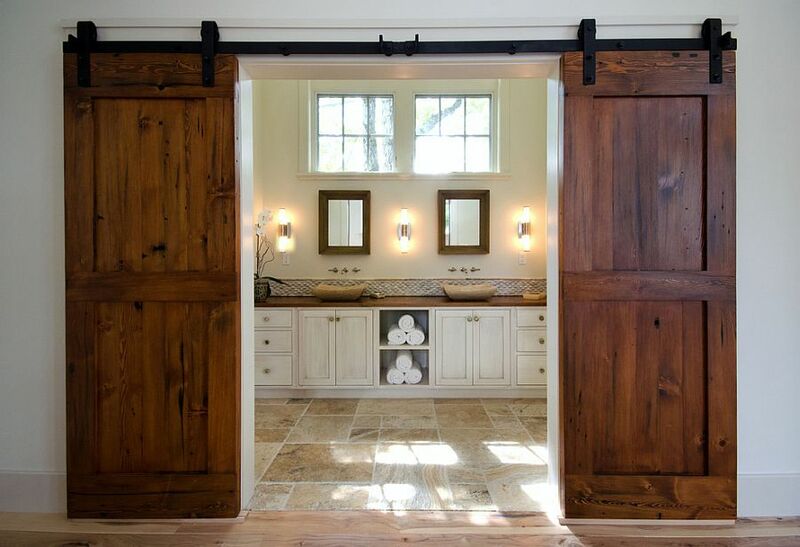 You don’t have to embrace rustic or farmhouse styles completely to add a barn door to your interior, and often the bathroom is the ideal place to embrace these sliding doors. 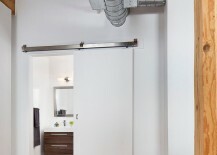 While some prefer the classic barn door in aged wood, others have turned to contemporary adaptations that use sleeker and shinier materials. 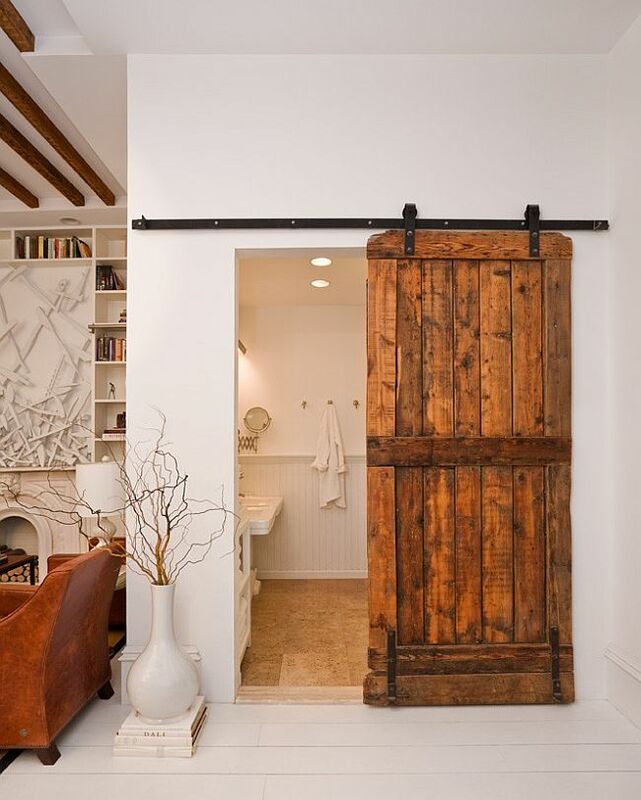 No matter what you like, the summer of 2015 is definitely the time to get on the ‘barn door bandwagon’! 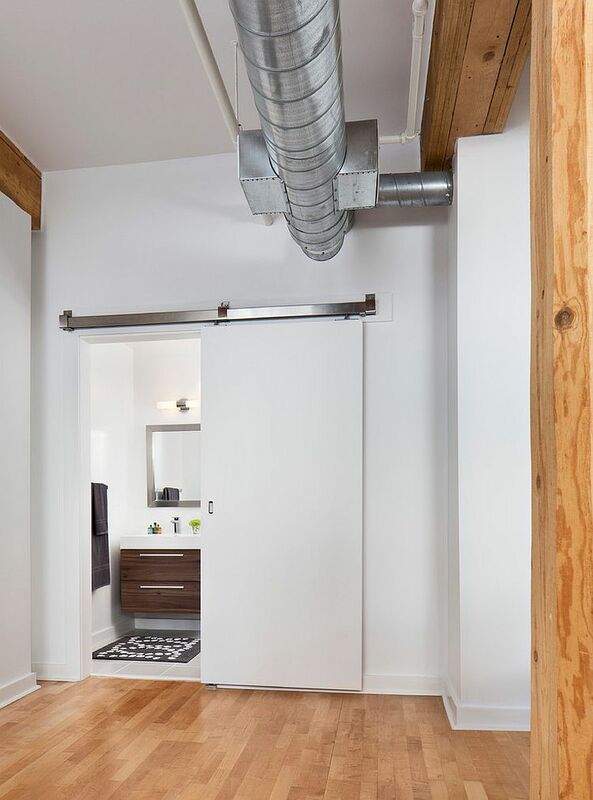 The traditional barn door was deemed a complete misfit in the urbane city setting where it not only felt out of place, but also less than useful. 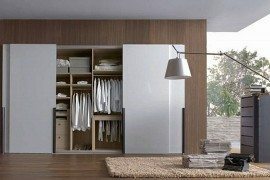 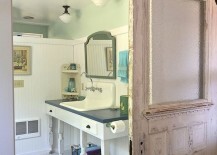 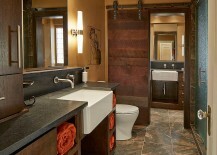 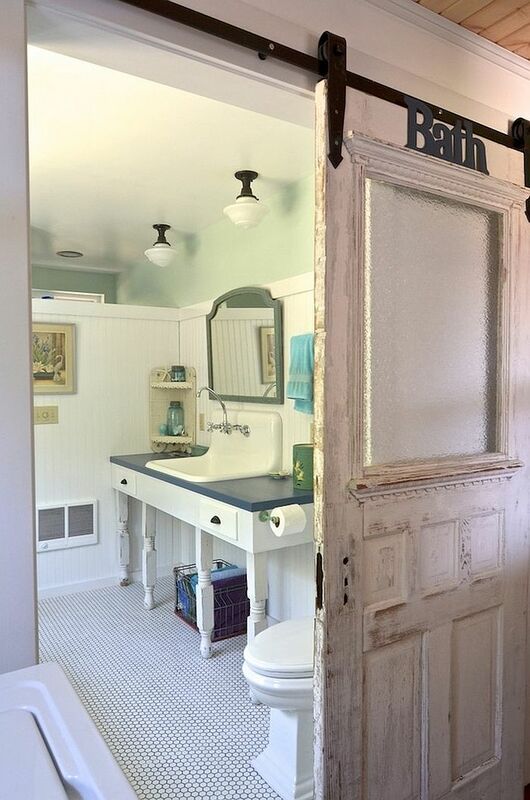 In the case of the bathroom, there is the added annoyance of the sliding barn door leaving out a gap or two that many of us find jarringly uncomfortable. 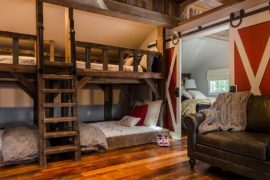 But soon interior designers decided to turn this perception on its head by adding those heavy wooden sliding barn doors to modern homes. 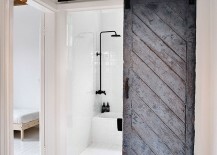 Bringing an entirely new texture to a space dominated by stone and concrete, the woodsy barn door offers a breath of unmitigated freshness. 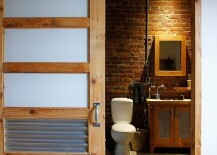 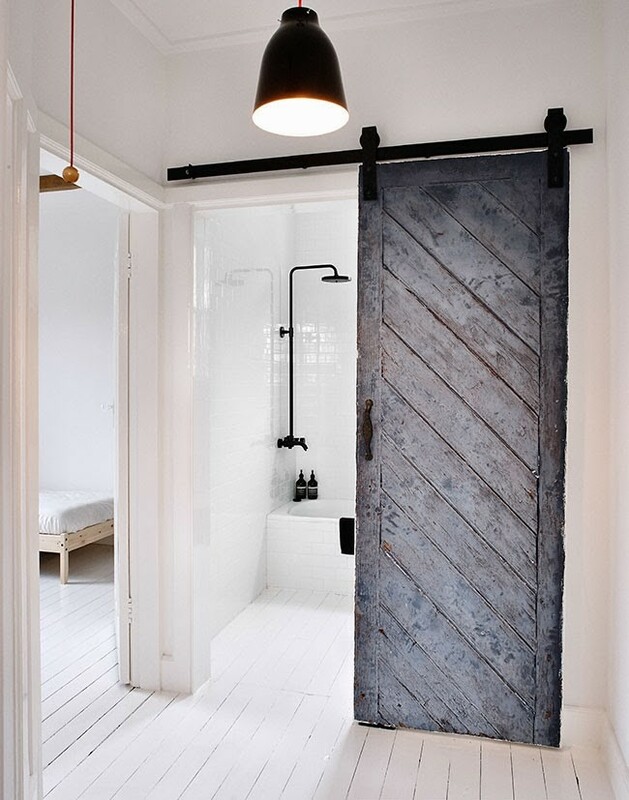 As we alluded to earlier, you need not completely switch over to a more rustic style if you want to use a barn door for your bathroom. 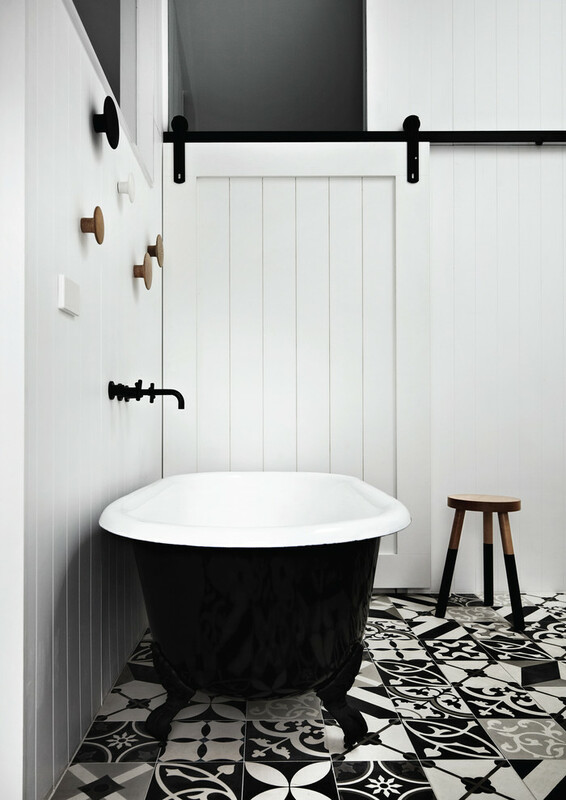 In fact, a contemporary backdrop lets the country life-inspired addition become an instant focal point that gets loads of attention. But for those still uncomfortable with large barn doors in reclaimed wood, modern alternatives in lighter tones of wood get the job done with a more refined panache. 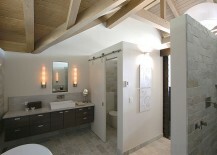 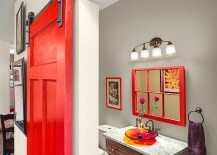 You can even paint the door white if you want it to seamlessly disappear into the neutral backdrop. 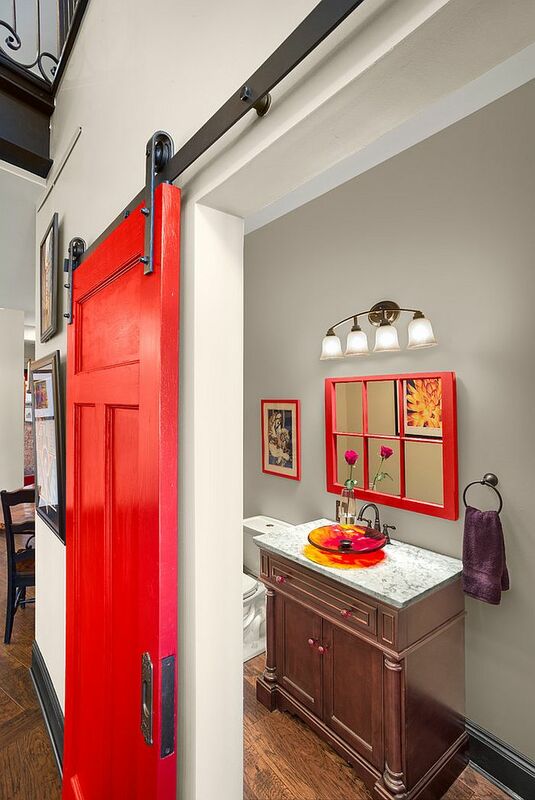 Another vivacious option is to use bright accent hues for the barn door, which surely promises to enliven that old, drab bathroom. 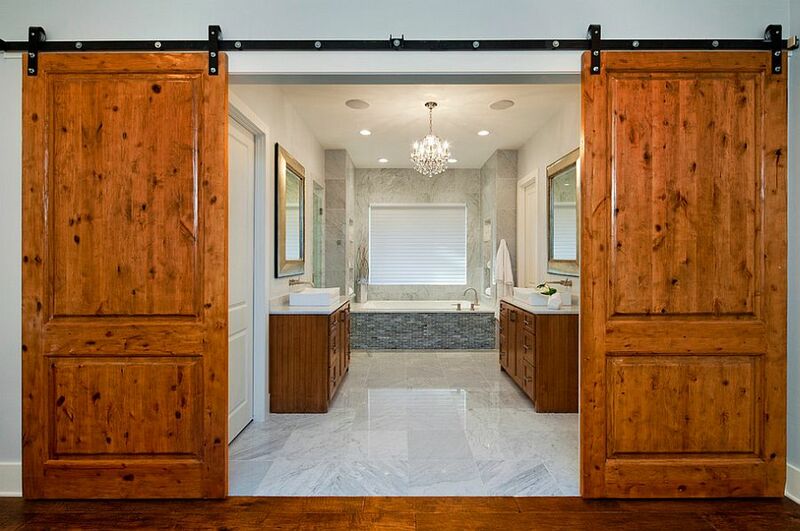 Whether you love the weathered wood barn door or a contemporary version in etched glass for the bathroom, it is the sliding system of the door that is the true star when it comes to ergonomics. 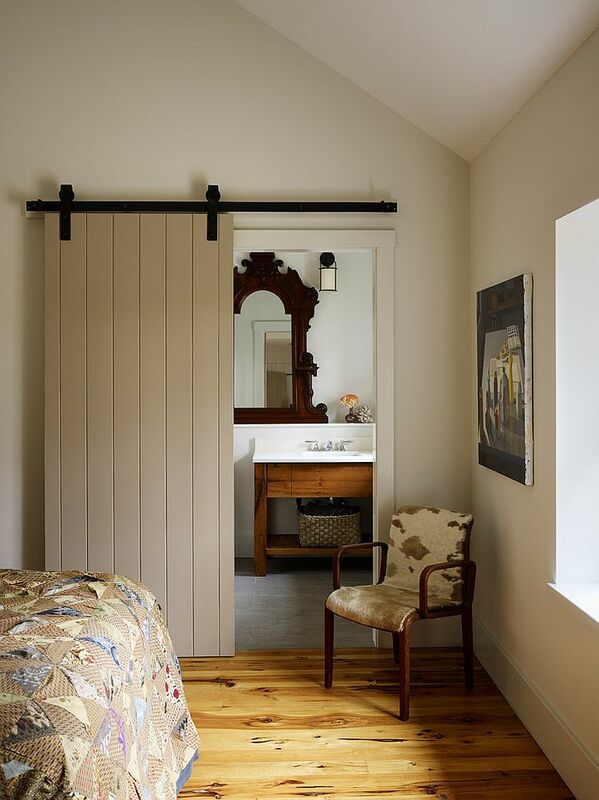 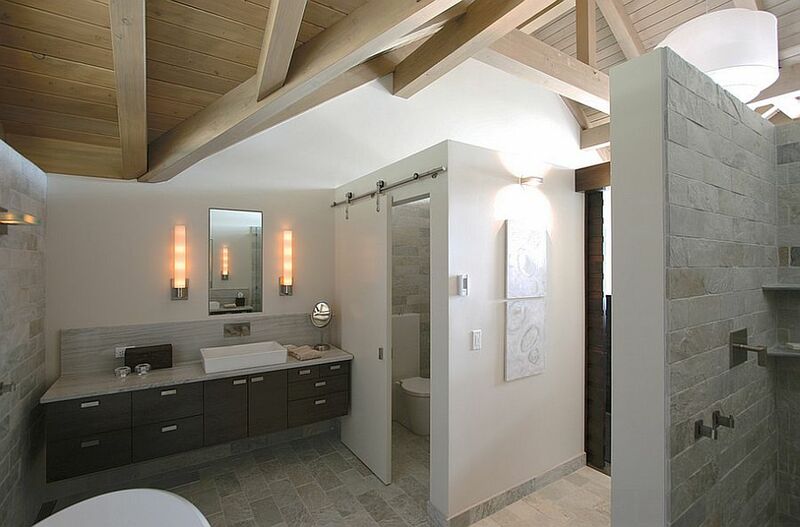 While your typical doors take up extra space because of their swing mechanism, a barn door simply slides out of the way and offers a fabulous gateway between your master bedroom and bathroom that takes up very little additional area. 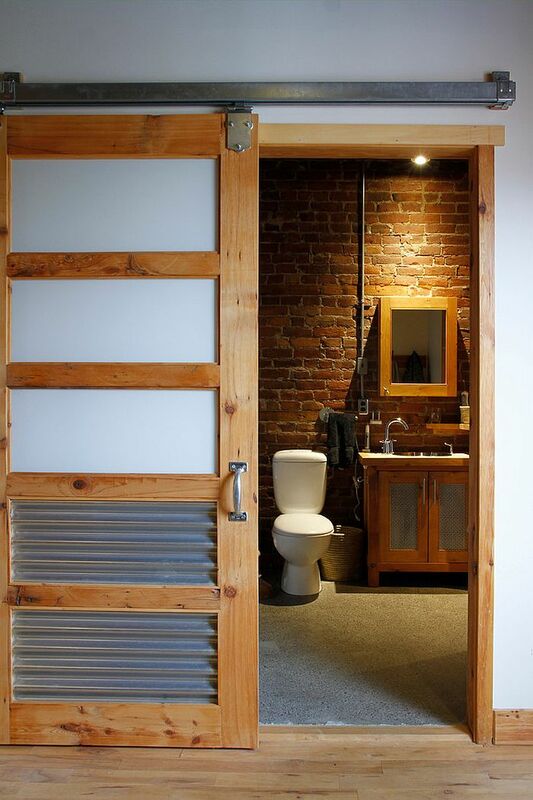 A quick note: make sure your interest in the barn door isn’t a fleeting love affair, and that you absolutely love its simple, understated style before opting for a quick bathroom renovation!